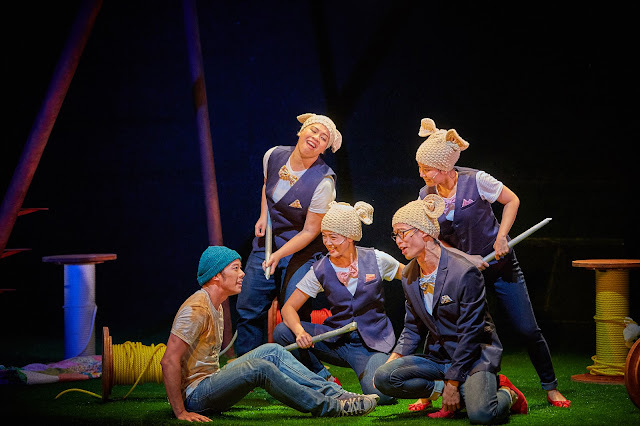 We caught the Tale of Peter Rabbit by SRT over the weekend. A tale specially curated to spin out of its original version, to bring in values and importance of family. 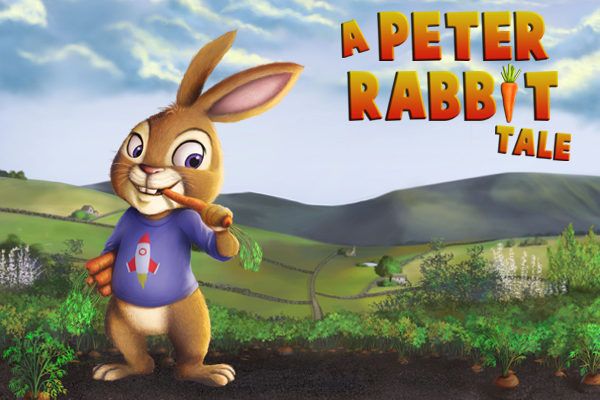 Peter is one rabbit who causes nothing but trouble with his constant mischief. His Mum had warned him about staying away from Mr McGregor's garden, but long ears apparently don't signify obeying ears. Peter sneaked into Mr McGregor's garden to steal some food. It was a narrow escape that he got away with only his jacket pulled off by MrGregor. This was one hilarious scene in the play, when the chasing was emphasized with the casts doing the slow motion run. Afraid of what his Mother might say, the only option for Peter was to leave home. While searching for the wonderful freedom of being himself, he explored and met new friends along his journey. He met some squirrels whom he thought he could be part of them. Only to realise, they are still largely different. No matter how hard he tried, he has no love for nuts. Then he continued his journey to find 'home'. Met some nice mice who taught him some skills on sewing. Still, no matter how hard he tried, he wasn't never part of them. He left and continued finding that warm ideal home of his. It was only when he met a hip and funky hedgehog that things started to turn a little soft and speak sense into him. He knew life wasn't that bad at home, his sisters whom he always squabble with weren't that mean after all. And Mum nagged because she cared! The kids and I specially loved Mr Hedgehog's role. A funky chap that's bound to send the kids laughing and rolling in their seats. By chance Mr Hedgehog runs a laundry business and on hand, needs to deliver a couple of washed laundry. Peter, trying to find acceptance, offered to deliver them. In midst, he found a parcel that was addressed to his home! It took him some long while before making a decision to deliver that parcel and return home. What an adventure Peter had in trying to find acceptance elsewhere! Everything else was history when he returned. He saw how much his sisters loved him and with much guilt, learnt that his Mum cried to bed every night since he left. Nothing beats coming back to home! Home is love and home is acceptance. While he didn't like doing the chores in the home, he knew every member in the family has a responsibility of up keeping the home. This heart-warming play is colourful and lively with catchy tunes that will keep the little ones swaying. We were very well entertained, even Juboy sat through it! It is a 50 minutes play that's easily digested for anyone above 2 years old. While stage props and costumes seemed to have downplayed in compared to previous productions, the essence is very meaningful and flavourful. We love the learnt values out of it. Most importantly, leaving home is never an option. 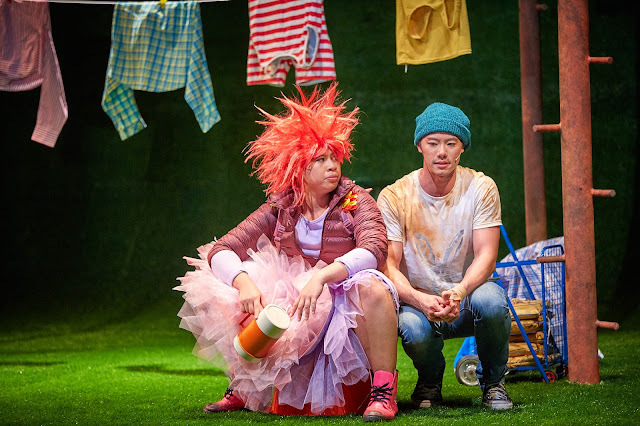 This is a great tale well adapted from book to stage. Catch it before it closes on 14 April 17. SRT's lobby is newly refurbished, bright and seemingly more spacious. I have to say, we love its new look! The Ant and The Grasshopper is an Aesop's fable about a very hardworking Ant and a Grasshopper with nothing much to do all day. 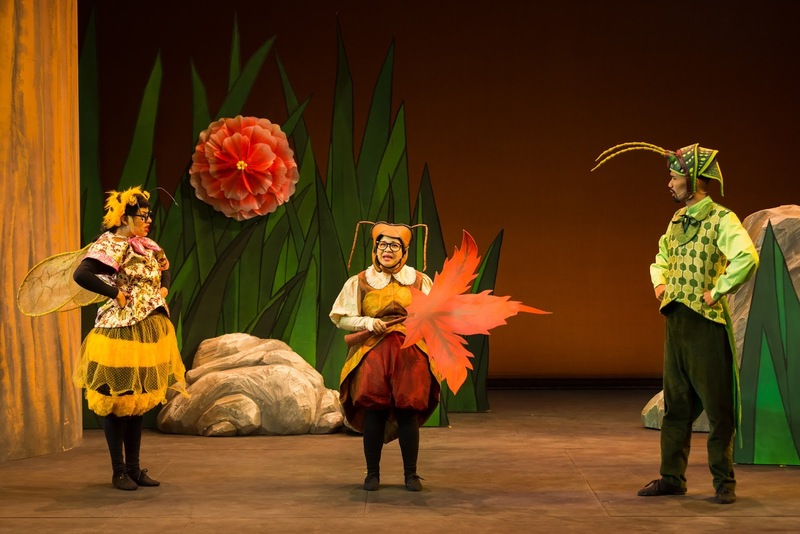 In this play by itheatre, there is a Caterpillar who visits time to time, and calmly carried on doing what caterpillars do best. The Ant would work all day long collecting grains of wheat and storing them in her larder, in preparation for winter ahead. The Grasshopper would laugh and say, "Why do you work so hard, dear Ant? Come, and rest awhile, listen to my song. Summer is here; the days are long and brIght. Why waste the sunshine in labour and toil?" In a Chinese saying, we had like to say enjoy the bitterness first, and then sweetness later. It describes what exactly the Ant was up to, working hard for the now just so the later is well prepared. While Summer doesn't last long and winter is soon here, the Ant who has got food stored in its home has got it all prepared for the cold freezing season. The grasshopper who has been singing and relaxing all day long wasn't prepared for the season. When winter arrives, he was left in the cold, freezing and hungry. Watching the Ant warm and comfortably prepared with her stash of food, he knew it was best to prepare for the days of necessity. We love the moral and lessons learnt from this play. While the Ant is really hardworking with no rest and the Grasshopper plays with no work, it taught us that the key to life is all about balance. Blending a little of both the Ant and Grasshopper's trait will be ideal. There is a time for everything. It taught us to heed the advise and warnings of people around us, and not just continue to live in our own World. Often, the most comfortable spot should not be permanent. Oh yes, and there was the Caterpillar who was afraid of change. The insects comforted her that nothing stays the same and that change can be a good thing. Along the seasons, she transformed into a beautiful butterfly who loved the change she had become. 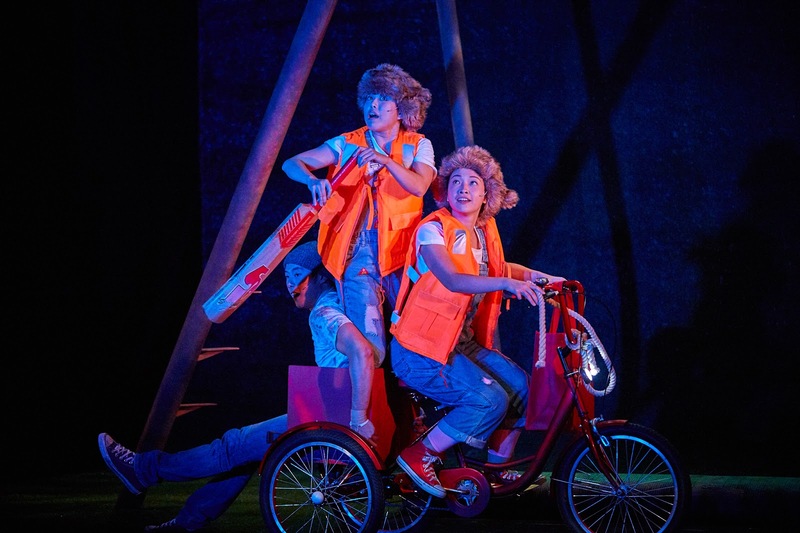 The play was bright, fast-paced and interactive with colourful characters and tuneful, catchy songs. We were well entertained not just by the play but the interaction with the insects who would get you off the seat for some exercise. 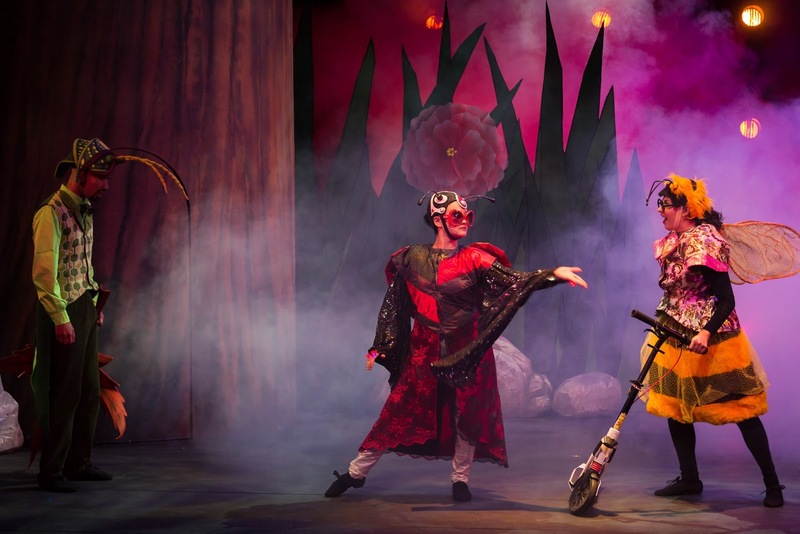 It was also highly humourous and the appearance of the ladybug, ladycoco is most likely to get you into stitches! Everyone loved her. It all ended well on a sweet note. We always say true friends are those whom you see during trials and hard times. We saw how the insects came together to render help with wonderful friendships displayed. This is a great play with meaningful lessons for take away. Work and leisure will be viewed differently again. Catch it before it closes on 19 March 2017! And don't forget your photo opportunity with the casts at the end of the show. 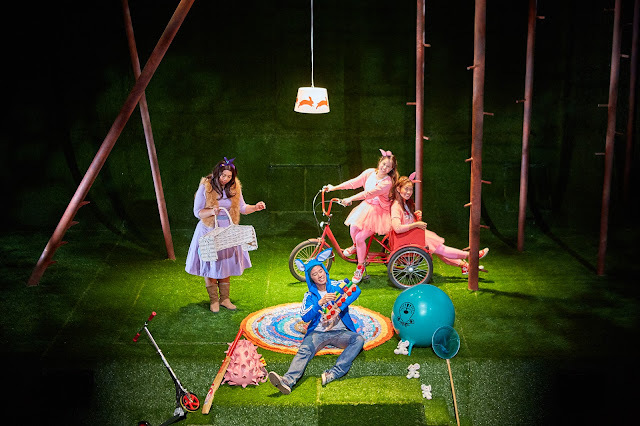 The Ant and The Grasshopper is a 50 minutes musical is suitable for THE WHOLE FAMILY – ANYONE 3 years old and above! Get your tickets here! Disclaimer: We were given tickets for the purpose of this review. No monetary compensation involved. All opinions are solely ours. The second born, Jare turns 6! In no time, it's another P1 registration phase for us. This boy being our first son, surfaced the many differences between parenting a little girl and a little boy. It really isn't quite the same. Apart from their individual characters, we know vastly boys are into trucks and girls are into tutus. It takes a load of tolerance to fully understand why he has got ants in his pants while sister is cool still when it comes to any waiting game. We knew there can't be the same expectations, there can't be equal results and milestones are different. Along the years, he has matured much in words, thoughts and acts. I knew he was getting more reliable as I saw how he cared for his little brother, ensuring his baby moves are well taken care of. 1. Don't be afraid of insects! Your Dad complemented me because he would rid roaches and other creepy crawlies without a tinge of fear. That makes him a hero easily. 2. Be Magnanimous! Leave the pretty petty to the girls, while you exhibit the noble and generous mind. Only with generous minds, you can achieve greater things. This trait makes up a man. 3. Don't be a hoarder of things! Always clean and clear out whatever stuff that has been categorized as useless. A clean and tidy man appeals. 4. In case you are not keen in further developing other skills, then Grades matter! If not, bring on those big dreams in mind. 5. It alright to drink, but Don't get drunk! It gets you all messed up and No! It doesn't impress. 6. Perspiration is inevitable. Don't be afraid of the heat and sweat, we are birthed in the tropics. 7. Read maps well. You have no idea how important it is for a man to lead. 8. Respect girls. Keep your hands to yourself! You should not do what you wouldn't like anyone to do unto your sister. 9. It's alright to cry. Just make sure you are alone or with Mama. 10. Be prudent, but don't be stingy. Generosity is an opportunity to bless. 11. Don't be a male chauvinist. We are always in one or more ways co-partners with the girls around us. There are girls who can inspire and empower your life. 12. Always love your family. You will meet new people and eye candies, but always keep Family in mind. Don't let anyone put your family down, stand up for them. Yeap, 12 wonderful word gifts for the boy. One to meditate on each month. Oh wait, my son turned 6 not 16 eh? That's ok, it's good to have an early start. Happy 6th Birthday, Jare! We love you so so so much, more than you will ever know. Thank you for always inspiring us to stay happy and positive. You do have a very contagious laughter that no one else has. Go on and spread that good cheer. Peter causes nothing but trouble with his constant mischief, and when he breaks the rules and steals from Mr. McGregor's garden, he knows he's gone too far. Afraid of what his mother might say, the only option for this little fugitive is to leave his warm rabbit hole and run away into the big world. Somewhere he can do whatever he wants and be free of responsibility. He goes on a musical adventure of new places and new faces as he discovers the importance of family and the wonderful freedom of being himself. A Peter Rabbit Tale is based on beloved children's classic by Beatrix Potter and beautifully imagined by Sarah Bundt. 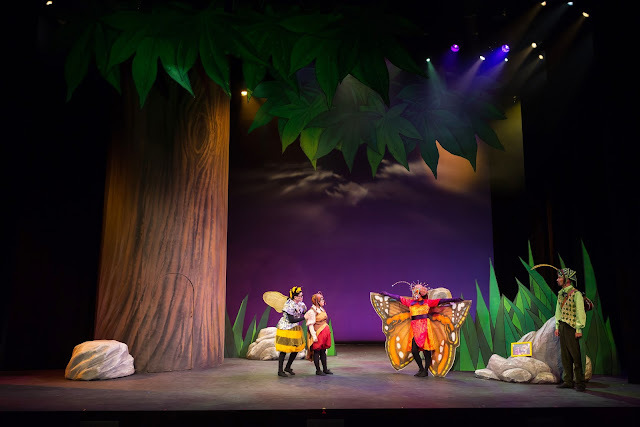 This play teaches children the importance of family and to cherish their loved ones. It is another heart-warming tale brought to you by SRT. Not to be missed! Get tickets here. Giveaway ends on 13 February 2017, 2359hrs. Best of luck!